This season Pekka Kuusisto returns to the Scottish Chamber, City of Birmingham Symphony and Toronto Symphony orchestras and debuts with Bamberger Symphoniker. He also performs recitals at Amsterdam's Concertgebouw, Dortmund Konzerthaus and London’s Wigmore Hall. Last season’s highlights included concerts with the Seattle and BBC Scottish symphony orchestras, MDR Sinfonieorchester Leipzig and Orquesta Sinfónica de Galicia. Collaborating with performers across the artistic spectrum, Kuusisto joins forces with the Finnish National Theatre for a new theatrical production Tabu, as both composer and performer. Regular chamber partners include Anne Sofie von Otter, Simon Crawford-Phillips, Nicolas Altstaedt and Olli Mustonen as well as working closely with composers such as Nico Muhly, Thomas Adès and Sebastian Fagerlund. From January 2016 he takes on the role of Artistic Director with ACO Collective (formerly ACO2) and becomes Artistic Partner with The Saint Paul Chamber Orchestra from the 2016/17 season. He also regularly directs the Mahler and Swedish chamber orchestras, The Deutsche Kammerphilharmonie Bremen and Britten Sinfonia. 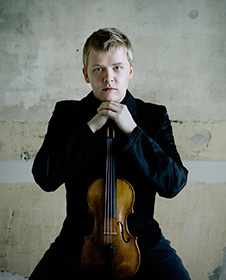 Kuusisto received the Nordic Council Music Prize in 2013 and is Artistic Director of the award-winning 'Our Festival', based in Sibelius’ home town. In 2015 he released a recording of Fagerlund’s Violin Concerto with the Finnish Radio Symphony Orchestra on BIS.